Wristies™ are the original wrist warmers from America. Like all good ideas, once you've seen them, they look completely obvious; a simple tube of high quality polartec fleece, like a long hand sock, with a hole for the thumb; insulating, breathable and water resistant. We sold Wristies at first just for kids, as they are so practical for young children, but we found that parents were so impressed, they wanted them too. Because the wrist and mid arm is warmed, blood keeps flowing to the fingers keeping them warm, so that not only are they great for outdoor activities, they are fabulous for all fine motor tasks: e.g. for pianists; for typing; for Raynauld sufferers etc. We are completely sold on Wristies - try them and we're sure you'll feel the same!! Sizes: Adult Smal (ladies); Adult Large (mens). Mr D W bought adult Wristies in Navy (Mar 2015) I recently bought a pair of Wristies from you, and having a community involvement, I wore them when delivering leaflets, door to door. They kept my hands warm, whilst leaving my fingers free to struggle with the letter boxes and the individual leaflets. Like all good ideas, it is obvious once somebody has thought of it. M S S bought Wristies Adult: Red Small (November 14) They have arrived!! Red colour is so warming just looking at it. They are to replace a blue pair that was given to me by my friend Jo. I work in the Historic Dockyard in Portsmouth. For many years on board HMS WARRIOR I suffered icy hands, until Jo had me try the Wristies she had purchased for an Arctic holiday. I am now working on the exciting Boathouse 4 Project and have moved from the cold Victorian warship to the freezing Historic Boat Workshop. Wristies are essential!! Thank you. Mrs T C bought Wristies Adult: Black Small (November 11) What a speedy service. I received my Wristies this morning (Saturday 12/11/11). They are really comfy and give complete flexibility to the fingers so there is no restriction to what you can do whilst wearing them for example typing, writing or sewing. I'm very pleased, thank you. Mrs J L bought Wristies Adult: Red Small (June 11) Many thanks I am delighted with my Wristies, I only ordered them yesterday and have never had such fast delivery. These are the second pair I have had from you and I will certainly recommend you. C T bought Wristies: Black 9-12yrs (February 11) The wristies arrived on Wednesday and are perfect. You might want to suggest that they’re great for musicians with cold hands. I used your website as Morley’s Harps were recomended by a friend but they don’t do smaller sizes for people like me with tiny hands. K S bought Wristies Adult: Black Large, Wristies: Red 9-12yrs (October 10) Thank you for a great service, I received the goods the next day. I have already worn my wristies around the house on a very cold day! Mr L W bought Wristies Adult: Navy Small (August 10) Comments: item arrived 1st class post to highlands of Scotland without any surcharge, thank you. My wife tried the wristies on and instantly felt the warmth! I will be recommending them to all my friends thanks again. Mrs N J B bought Wristies: Red 9-12yrs, Wristies Adult: Black Small, Wristies: Navy 9-12yrs, Sizzler Mitten: Black 9-10yrs, Trespass Lugs Hat: Red/Flint 8-10yrs (February 10) The order arrived this morning, what amazing service. We are off on our first family skiing holiday to Switzerland with the British Disability Snowsport team and the boys love their new wristies. Great mittens for our disabled child, his twin is after the hat! You might look at the Fledglings website with a view to supplying the Wristies. P M bought Wristies Adult: Black Small (December 09) Wristies arrived safely and promptly and exactly what I ordered. G bought Adult Wristies: Red Small (June 09) I am happy to tell you the red wrist warmers have arrived this morning and they are exactly what I need. S N bought Wristies Adult: Black Small, Wristies: Raspberry 9-12yrs (February 09) Wristies are fab! They arrived this morning just in time for the snowiest weather for 18 years, what good timing! Both my daughter and I had lovely toastie fingers. Thanks very much. K R bought Wristies Adult: Black Small (January 09) Thanks v much for your swift and personal service. wristies arrived safely. Previous customer Dr J M bought Wristies Adult: Navy Small (December 08) Glad to report that Wristies are an essential part of my life here in frosty Scotland. I do see people going about without them, but I do not know how they do it! This morning I realised that I have somehow mislaid one of a pair of Wristies, and having combed the house, I still cannot find it. They are so important to me, that instead of waiting the usual three or four days, when the missing one will almost certainly turn up, I ordered the new pair immediately. I turned 70 this last weekend and my two children were here in sequence over several days. I noticed that they were wearing mine a lot, and suspect that one of them has gone away with one in his or her pocket! Thank you for prompt posting. I do pass on your address to people, and wish you and family a happy Christmas. 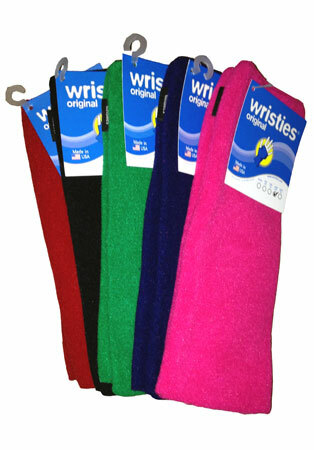 Mrs A L bought Wristies Adult: black (Feb 2008) Thank you for your extremely speedy service. This is my second pair of wristies, I love them so much and to my distress lost one recently and so had to order another pair as I can't do without them! I've been wearing them all winter in my cold office as well as outdoors. I can even type with them! Thanks for a great product and very efficient service. I'm always recommending your wristies! Returning customer Dr J M bought adult Wristies in Red (Feb 2008) I look forward to another pair of Wristies, red this time, so that I can find them more easily! The blue ones tend to get put down, possibly on a pile of scarves, hats etc. and never seem to be at hand when I want them. I have been so pleased with them, and wear them constantly. My son bought a pair from you; he is a cellist, and finds them ideal for practising in cold rehearsal rooms. Then his girl friend 'borrows' them, so he might get another pair, too. I gave your nice flyer which came with my first order to a friend who lives nearby, and whose daughter is just a year old. They liked the look of your waterproof gear, and when E is a bit older and a bit more mobile, I will remind them. Kind regards, on a very snowy day here in Scotland. Wristies obligatory! Mr J M bought Adult Wristies in Navy (November 2007) I have been wearing my Wristies for a couple of hours, and I do not quite know how I functioned without them! I am quite delighted with them. Your service was prompt, efficient and friendly. Enjoyed your website a great deal...lots of kids doing lots of fun things. Brought back some good memories! I don't really think you want a picture of an elderly man wearing his Wristies; somehow it doesn't quite fit in with the rest of the website! But I have already recommended them to my son, who is a cellist and gamba player, and will recommend them to my daughter when she gets back to the UK shortly. She is a violinist. Both are touring a lot, all over the world, and are forever complaining about very cold practice facilities in strange places. For string players, they would seem ideal. Most of them have some kind of tendon problems from time to time and are looking for ways to keeping hands and wrists warm, especially when warming up. This might well spread into a small burst of activity from string players if the children like them, and then spread the word among their colleagues. I will also spread the word to my medical practice. For anyone who can never seem to get warm hands, with age related problems or medical issues which might mean loss of weight, and blood vessel fragility..all sort of things..I think they could be a great help. I will show them to my doctor next time I see him. People who live on their own in a rather cold house, like me, will be interested. We can discuss commission later! I roamed the internet for some time looking for fingerless gloves, and found Damart and the like. Clearly I must have found a link to you, as well as to wristies.com. You carry a fair range of wristies for kids, lots of colours and sizes. But is is going too far away from your main brief to have a wider range of sizes and colours for adults? I could not find anyone else selling them in the UK, though there may be others I did not find. But I think there would be quite a number of adults interested for all sorts of reasons, from fashion, musicians, elderly, medical, people with seriously cold hands, people who live in Scotland if that is different from the last! In other words, not just mums who like the ones you sell to their kids. Though I quite see how you got into it. I shall now mind my own business, and not tell you how I think you might expand yours!! Just a thought, as I type this on my laptop in my wristies on a cold afternoon in Scotland.